Over the years, we’ve had the privilege of working with some of the biggest names in broadcasting to help improve their content delivery and production efforts through our wide range of products and solutions. One such project, which until now we have not publicly disclosed, involved the biggest football (soccer) league in the world. Sports Video Group recently published an in-depth interview of Mark Wilson-Dunn, Vice President of Media & Broadcast, BT in which he discusses this major contribution project – one which BT delivered to the Premier League Productions (PLP), with the help of Nevion equipment and software. PLP, the broadcast company responsible for capturing all the action of the UK’s football Premier League, went out to tender for a complex and comprehensive fibre-based contribution network solution. As discussed in the article, the objective of the project was to allow PLP to seamlessly receive streams from all 20 stadiums in the league and transport them to the operational facility of IMG, who partnered with PLP on this project. The tender from PLP was eventually awarded to BT Media & Broadcast, who are a long-standing partner of Nevion’s. We have been supplying video interfacing equipment to BT since 2004 and have been assisting in video transport for many years prior to that. Over the years, more than 5000 modules and 750 multi-channel IP systems have been deployed by BT. From the get-go, it was clear that various Nevion products were going to be required as part of this extensive project for PLP. While the solution itself is based on an IP network consisting of Cisco routers, BT opted for the Nevion VS 902 media nodes to enable IP encapsulation and protection, and the Nevion nSure FCS 1000 Plus probes for monitoring purposes. All of this is then managed by our own VideoIPath network management system. 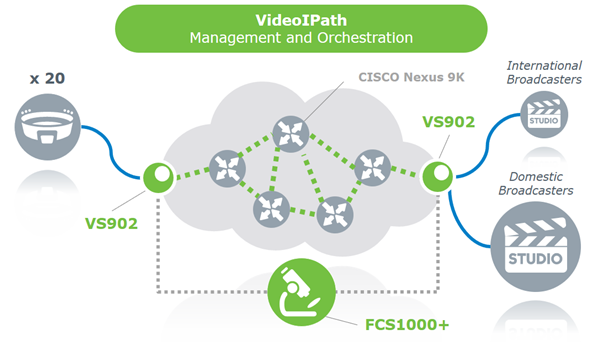 VideoIPath is essentially the beating heart of this contribution network. It’s used by BT to request links for connections to any of the 20 stadiums, as and when required, and it controls all of the media nodes as well as the Cisco routers, which allows it to always ensure the most efficient route across the network is being taken advantage of based on bandwidth requirements. It’s also used to monitor the entire network based on the information gathered by the FCS 1000 probes. Thanks to the solutions delivered by BT (and leveraging the capabilities of Nevion’s products of course), PLP is able to benefit from an IP contribution network that provides an astounding number of uncompressed feeds. There are around 20 uncompressed HD signals being transported from each of the 20 stadiums in the network, which amounts to approximately 32 gigabits of data for each stadium. For major games in the Premier League calendar this figure can be increased further, with up to 32 uncompressed HD-SDI signals being transported from stadium to operational facility. Most importantly, however, our partnership with BT means PLP can enjoy an extremely low latency and reliable contribution network that dramatically improves the way it broadcasts Premier League matches to viewers at home. This was a fantastic project to be a part of, and one that football fans across the UK and beyond will be able to benefit from. With IP technology at its core, PLP’s new contribution network is fully future-proofed and scalable, which will allow it to continue thriving in the years ahead and viewer demands and bandwidth requirements grow in tandem.